The TAST stitch for week 10 is running stitch. This time I have a really old sample to share. It’s on an embroidery bag I made when I was about 8 years old. This is a small detail of the border, you can read about my bag here. My TAST 2007 sampler. At the time I wanted to skip the stitch, because I didn’t know what to do with it. Then I just started and filled a square with running stitches in stranded floss. I remember I was very surprised by the result. 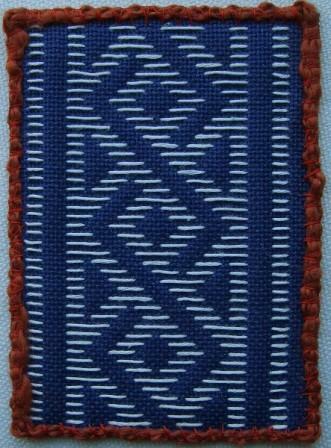 I made this ATC for the Stitch Explorer challenge pattern darning. 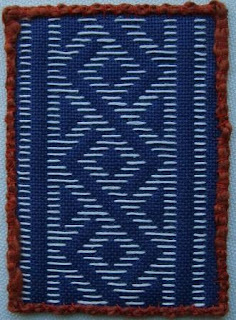 The pattern is stitched in running stitches with DMC broder special on blue linen. 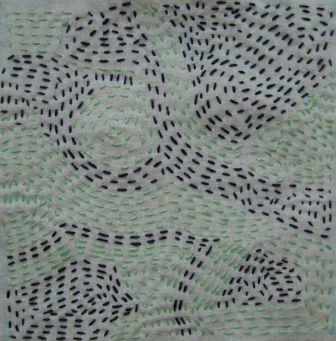 This was my own design for the Stitch Explorer challenge pattern darning. I stitched it in running stitches with 2 threads of stranded DMC on Aida. There’s a bigger photo of this zebra at my Flickr-page. I’ve used running stitches on some CQ too. 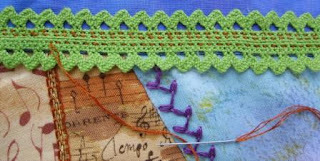 Here I used it to attach the green lace with stranded floss on block 10 of my Crazy Monday quilt. A detail of another seam on block 11 of my Crazy Monday quilt. From top to bottom I used running stitch, cross stitch with French knots and straight stitches, buttonhole stitch. A seam on my Tilda ornament. I made 4 rows of running stitches with 2 threads of stranded DMC and laced it with a knitting yarn (half cotton, half acrylic). I added beads when the embroidery was finished. This last sample is part of my PLOS border sampler. It’s a stepped threaded running stitch with perle 5 and Caron Rachelette. I didn’t expect to find so many experiments with running stitches in my embroidery. I think I’m going to experiment with many different threads this week. I love the effect of the embroidery on the second pic! Wonderful results from such a simple little stitch! Well done. Such beautiful varieties of the simple running stitch. Looking forward to more of your samples. I love the second third and Zebra very much. Annet, all the works are wonderful!! special like for Zebra and ATC.. Thank you, Annet, for sharing all these wonderful examples of running stitch. I like the "Zebra" most! Thanks for showing some of your beautiful running stitches. Hope to see you do a new one this week! What a wonderful amount of different projects you have using the running stitch! From such a simple stitch it's amazing how many fabulous different designs you've made. I'd best get cracking on my sampler piece! great examples of running stitch, thanks for sharing. The top picture brings back memories as I did something similar at that age. Love the zebra. 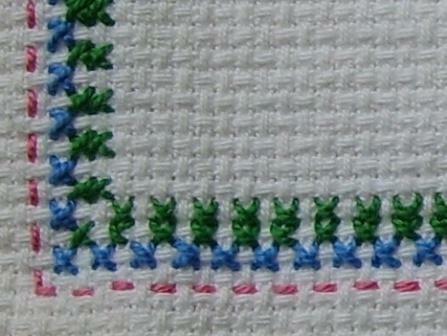 once again i come to your blog and am so excited by all of your examples of a stitch~! i've linked from my blog to yours as this is a very shareable assortment of ideas. Beautiful work with so many samples! Your Zebra is on Pintangle's highlights for the running stitch... Yea! Wow! 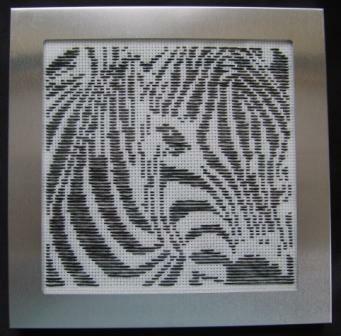 Beautiful samples - especially the zebra!